The 2018 Protect Wisconsin Waterways Sweep in Waupun was highly successful. 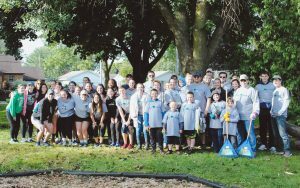 We had a total of 43 volunteers, from community members and families to students, helping clean up a total of 4 parks around the city. Over 50 impressions were made on community members due to a 5k passing one of the clean up locations. Due to the recent storms, volunteers were mostly helping to clear brush from the parks and place it near the street to be picked up by the city. At West End Park, the initial clean up location, volunteers signed in and then were offered event t-shirts. Volunteers could also take promotional items, such as pens and stickers. Overall, the 2018 Protect Wisconsin Waterways Sweep in Waupun was very beneficial to the community and had a great turnout.